The Mets are still in it. The team’s record sits at 27-26, 3.5 games out of first place. They may not be a championship-caliber team, but the NL East is there for the taking. Beyond that, the National League itself can be had – the Cardinals are struggling, the Phillies can’t hit and the Padres are in first place in the NL West. The Padres?!?! But before they go out and acquire a pitcher like Roy Oswalt – or even Kevin Millwood – the Mets need to do something about Oliver Perez and Gary Matthews Jr. Unfortunately, each player is owed a hefty sum – so it’s not that easy to cut or trade either of them. It’s pretty simple, really. Everyone loves a road trip movie and reality shows are everywhere. It’s a slam dunk for SNY’s programming schedule. 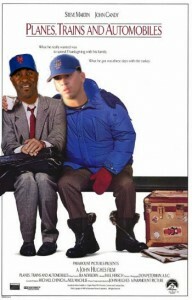 At the end of tonight’s game in San Diego, the Mets will board a plane to New York. But Ollie and GMJ will not be on that plane. Instead, our heroes (I use the term loosely) will be given the keys to a 1982 Buick Regal with no air conditioning. The car will be painted in Mets colors. They have to drive back to New York – or TOWARDS New York, until their car dies. That’s when the fun begins. Both players remain on the DL until they meet the Mets in a city for the start of a series. Even if the Mets have moved on to another city, Ollie and GMJ are required to go to their next assigned city to pick up their next crappy car (painted in Mets colors, of course). Once the car dies, Ollie and GMJ must find an alternate route to the next city. This includes – but is not limited to – hitchhiking, walking, trains, blimps, and skateboards. If our heroes meet a Mets fan during their travels, they must apologize and then take the fan to dinner and apologize some more. The entire thing will be filmed and aired on SNY. Kind of like Yankees Ultimate Road Trip. At any time, either player can simply give up and forfeit the money owed to him by the Mets. *It will be interesting to see if Ollie’s driving is as erratic as pitching. I don’t know how GMJ is going to sleep with Ollie doing 90 mph all over the highway.